Riding bike in Thassos island is ideal vehicle to explore new places and also to do sports when you go on a vacation. Cycling in Thassos island, beautiful asphalt roads to land roads, think about it. With your family, sunny weather and Thassos beaches and villages. Cycling in Thassos island tith small kids it’s not possible to do long cycling treks or steep mountain trails. So, you can choose road cycling through peaceful rural areas, and stop here and there for sightseeing, for a game of volleyball or cards, ice-cream, snack, etc. One of our favorite locations for family biking is Thassos island in Greece. 1. Go biking in spring or autumn. The weather then is not too hot or cold, but pleasantly sunny and dry. Also, Thassos roads are almost desolate outside the high season. 2. Do not bring bikes with you, instead – rent bikes. You can find very affordable bike rental locations in Thassos, charging EUR 5-10 per day per decent bike. Child seats and trailers are also available. 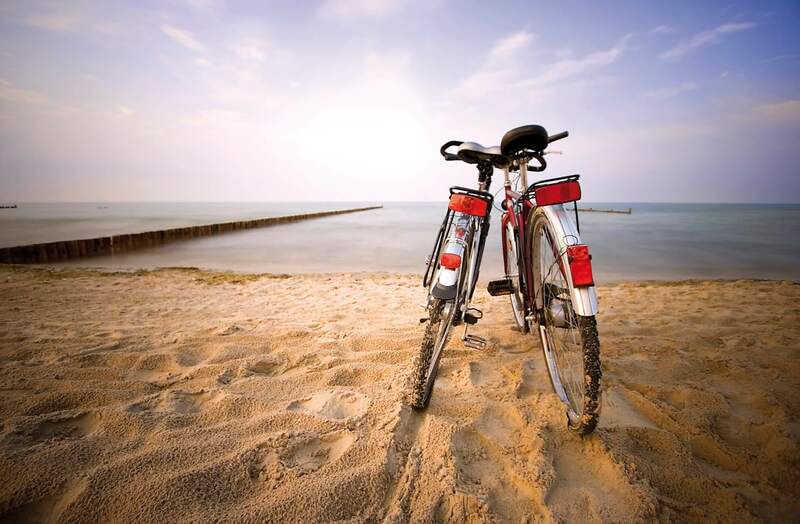 You may circumnavigate the whole island by bike within 3 days, if you do a veery leisure biking. The whole circumnavigation of the island is approximately 100 kms, by the main road. Our family of 4 covered approx 40 kms within a day, biking about 6-7 hours, including many stops. So, instead of staying at one place and choosing between few possible routes, which you’ll have to bike back and forth, take little luggage with you and stay at several different places alongside the road. Each day you’ll bike a different route, and at the end kids will be excited to have circumnavigated quite a big greek island! The road is generally a pleasant one – not too steep, easy enough for a 10-year old. However, plan frequent stops on the uphills, a few of them are long and fairly tiring for kids. There are many picnic areas alongside Thassos road, including sheltered picnic tables, and they offer amazing sea views. Remember to also take plenty of water, since some road passages lack shops or fountain taps. 6. Prepare for swim breaks. The road passes by so many beaches with crystal clear water (with Paradise beach being our favorite one), you’ll be tempted get off the road for a few hours to have a dip. The water is warm enough for very small kids starting end of May, and then through the end of September. Along the road you can find the Monastery of Archangel Michael, and not far away from the road are places of interest such as the Ancient City and the Ancient theatre. Thassos ring-road is mostly shady but at places really exposed. So, put sunscreen even if the day is not too sunny- when biking, the wind, sun and sweat combined really contribute for an easy sunburn. Many Thassos tavernas (outside the noisy beach areas) have a kids playground or lovely gardens where kids can play . The pricing in Thassos tavernas is generally lower than on the mainland, but everything tastes amazing. Kids menu may be available on request. Thassos is becoming popular for its mountain biking too, and there are several mountain bike races taking place throughout the year. During such events the rental locations, roads as well as accommodations tend to get crowded. Ask your bike rental company whether or not your planned vacation dates overlap with an event of this kind. Once upon a time a wrinkled, dog-eared, hard-copy map was the ultimate bike tour companion. Now, it’s a reliable GPS or navigation app. Opt for a durable and multi-use GPS product designed with adventurers in mind. Smartphones are also a fantastic option if you’re likely to have regular access to electricity and the internet. You can download maps that don’t just show you the best roads, but the best off-the-beaten-track routes for cycle touring. The Maps.me app is detailed, easy to use and now shows the route elevation on the bike option in most countries. Enjoy your family vacation on bikes! And feel free to contact us with any questions regarding biking in Thassos, we’ll be glad to help as best as we can.